SuperHeroes by Michel Parry, Sci Fi. Book is in good condition, all pages intact. 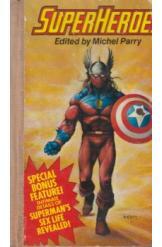 A collection of short superhero stories by Robert Bloch, Norman Spinrad, Larry Niven, and others. Collected and edited by Michel Parry.